The new Museum at the Gateway Arch completely replaces the original 1976 museum. 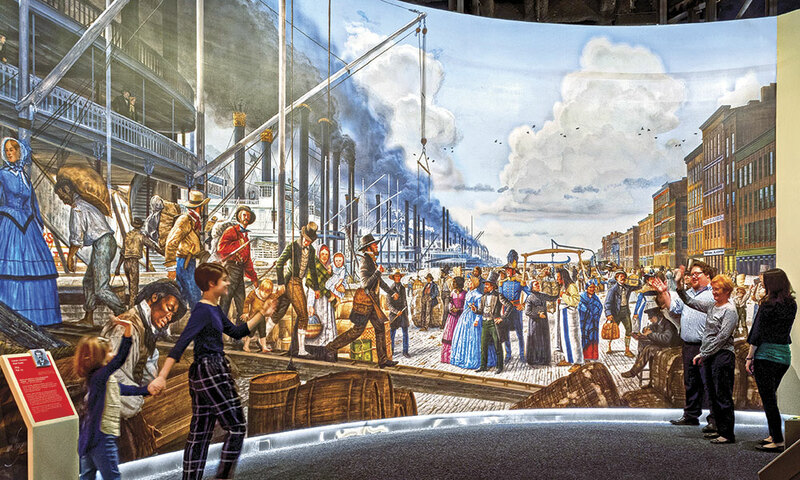 Visitors will enjoy touring the six themed galleries that feature interactive exhibits, including The Riverfront Era, which highlight St. Louis’s role in the westward expansion of the United States. 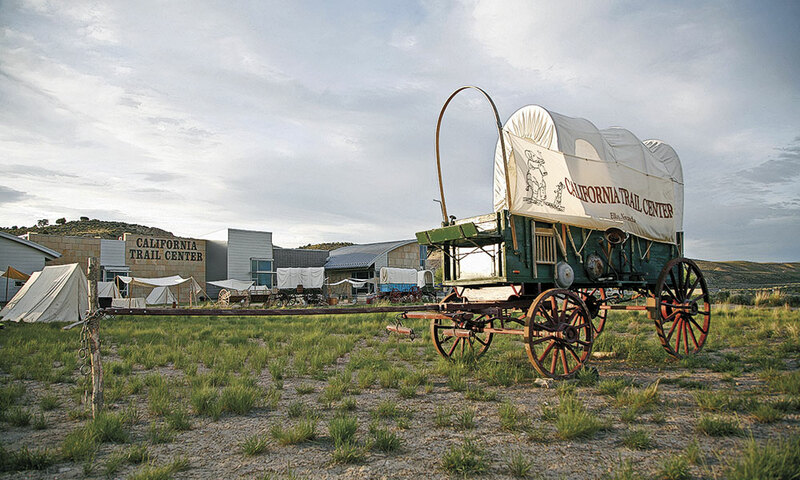 Get your mule, load the wagon and let’s take a look at the best museums of the West. 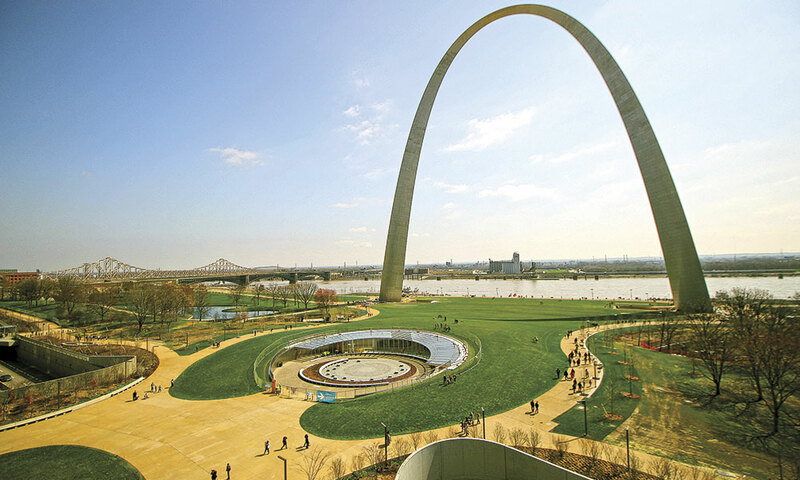 St. Louis, known as the Gateway to the West, takes our top museum spot this year with the long-awaited reopening of Gateway Arch National Park (formerly Jefferson National Expansion Memorial and Museum of Westward Expansion). And we find it fitting to also recognize many of the museums and sites that celebrate Western forts and trails to mark the 175th anniversary of the Oregon Trail and the 50th anniversary of the National Historic Trails Act that has done so much to recognize and preserve the pathways across the West. When you set off on an exploration of these museums, we know you need to have a place to lay your head, so we’ve come up with a selection of historic accommodations—from cabins to officers’ quarters and even a steamboat. Each museum featured has unique and important collections, and many of them host temporary exhibits well worth seeing. On July 3, 2018, the Museum at the Gateway Arch will open as a centerpiece of the Gateway Arch National Park, formerly known as the Jefferson National Expansion Memorial. Visitors can now walk from the Old Courthouse across Luther Ely Smith Square over the highway to the new West Entrance to the Arch visitor center and subterranean museum. On July 3, 2018, Gateway Arch National Park and the Museum at the Gateway Arch debuted its new visitor center, museum and park. The $380-millon renovation expanded the Luther Ely Smith Square with a walking park from the Old Courthouse to the St. Louis Riverfront and Keiner Plaza. 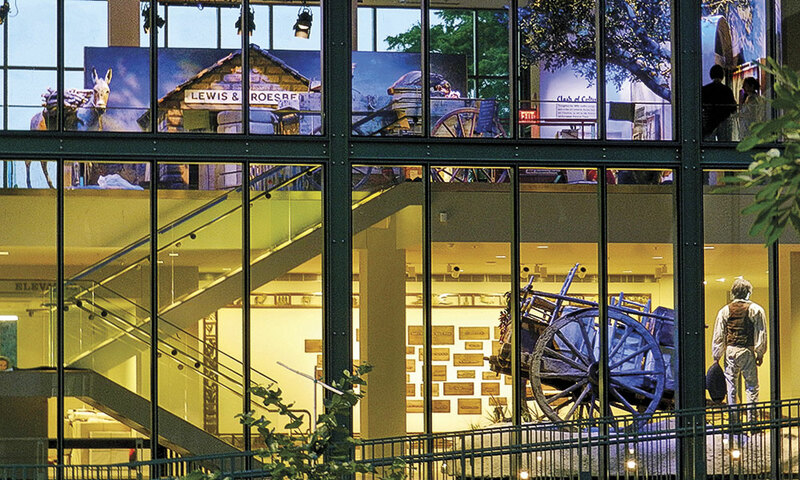 The highly interactive museum provides fresh perspectives on the story of Westward expansion. 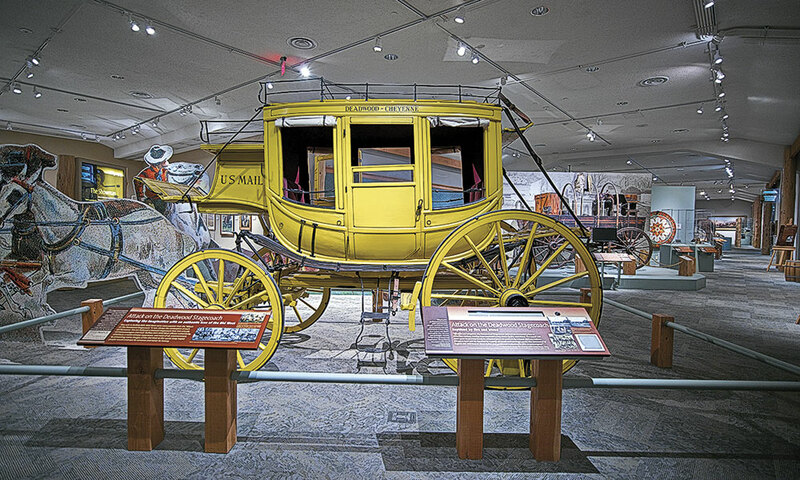 The centerpiece of the Buffalo Bill Center of the West’s five museums is the Buffalo Bill Museum, which includes two “Deadwood” stagecoaches that were used in his Wild West show. 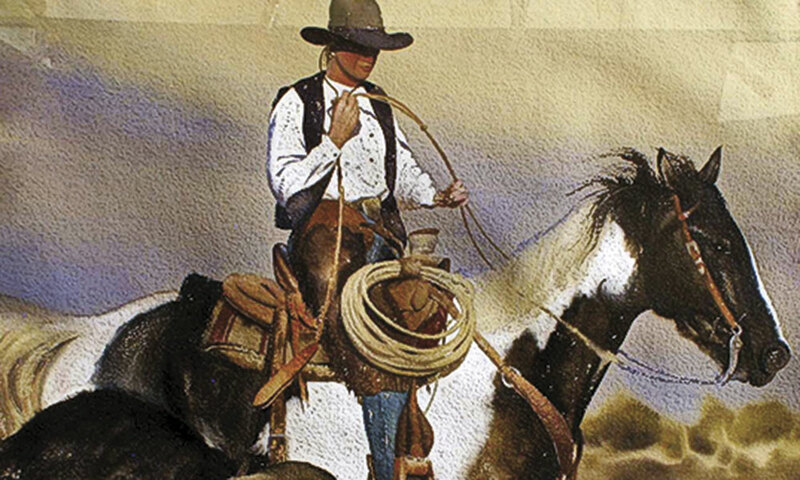 The diverse display of cowboy chaps in the Abe Hays Family Spirit of the West Collection is an ongoing exhibit of Western cultural artisanship at Western Spirit: Scottsdale’s Museum of the West. The beautiful design of this building (its rib-like structure evokes the spines of the saguaro cactus, and the rainwater collection in the garden where the walls “weep” with condensation, evokes the natural varnish on canyon walls at Canyon de Chelly) is just a taste of what you will experience once you enter this museum filled with outstanding art, cowboy gear and ranch paraphernalia. In 2018, visitors to the Witte Museum’s “Confluence and Culture: 300 Years of San Antonio History” will enjoy seven immersive and interactive exhibits that interpret and celebrate the city’s tricentennial. “Confluence and Culture” highlights 300 years of history in San Antonio showing how the city has been a hub under many flags. This exhibit runs until January 6, 2019. Other recent exhibits include a display of historic maps that showed how Texas has been connected for 300 years by trails, rails and roads. 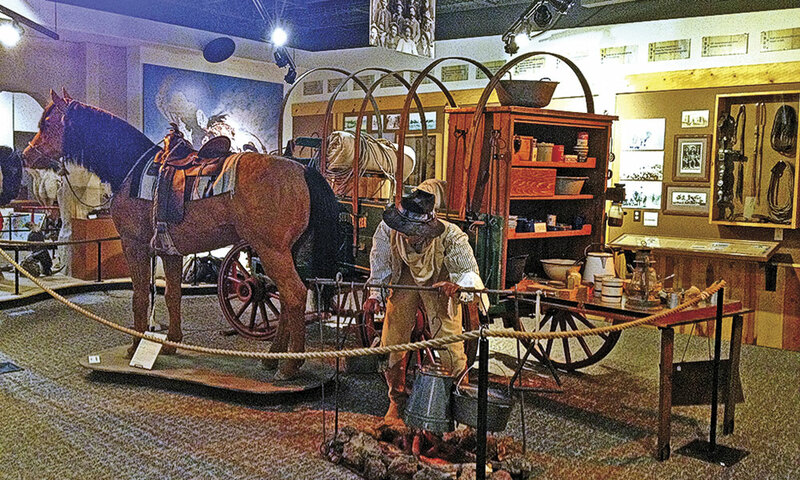 The “People of the Plains” permanent exhibit at the Panhandle-Plains Historical Museum in Canyon, Texas, chronicles 14,000 years of the region’s cultural history, including cattle ranching. Thirteen works by Robert Lougheed were added to the “Horses of the World” exhibition, and the museum also tipped its hat to pop culture with exhibits representing the cultural revolution from Buddy Holly to the Beatles, Civil Rights heroes and the Cold War. Returning to Old West themes, the museum recognizes “Lifeways on the Plains” in an exhibit that includes a lance and headdress that belonged to Quanah Parker, plus a Kiowa calendar and other pieces from the museum’s art and photographic collections. The California Trail Center is conveniently located off Interstate 80 eight miles west of Elko, Nevada. Managed by the Bureau of Land Management, the living history center provides an interactive experience for all generations, including re-enactment events held throughout the year. To celebrate its fifth anniversary this year, the center hosted a special exhibit by California artist Ann Belton. “EIDOS: Contemplating the Pioneer Experience” has seven stations on the center’s grounds and hiking trails, each representing possessions travelers would have discarded from their wagons as they journeyed to California. 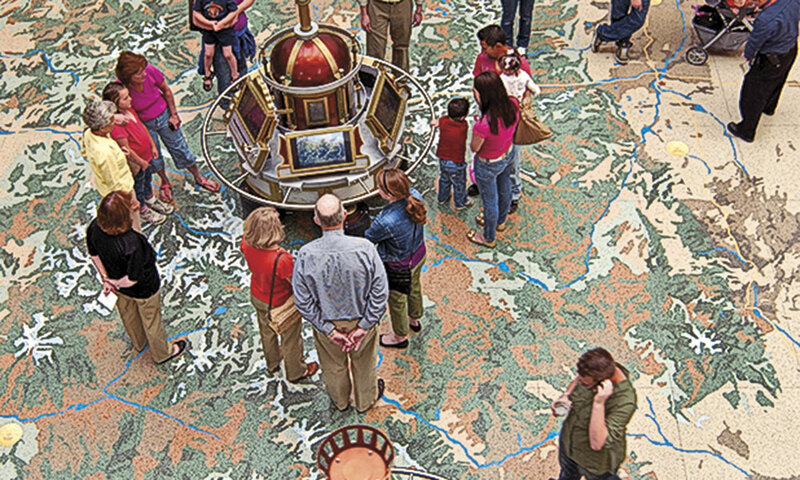 Upon entering the atrium of the History Colorado Center in Denver, Colorado, visitors will walk across a grand entryway exhibit of the state’s geographical features to the interactive H.G. Wells-inspired time machines of the mile-high state. Denver, CO: Visitors stepped into four postcards for an interactive experience as the museum paid homage this year to postcards from Colorado. A recognition of murals in Colorado is coming to life as artist Anthony Garcia Sr. is hand-painting one of the museum walls. His work, titled Self-Preservation, represents different cultures. 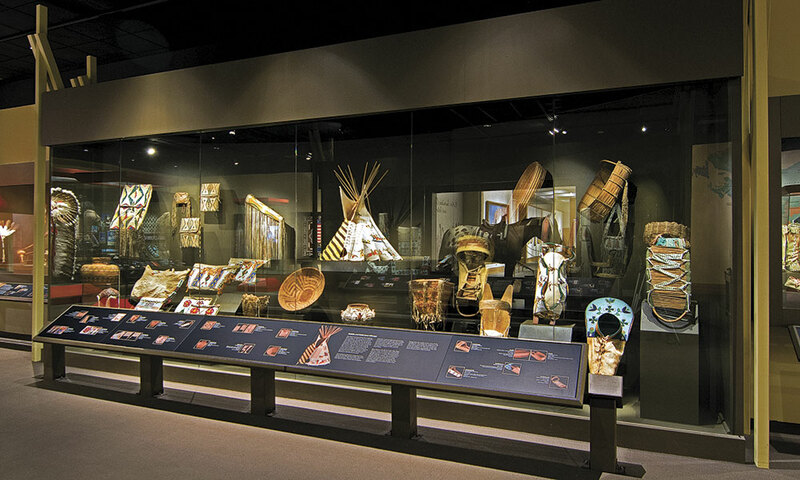 The National Cowboy & Western Heritage Museum in Oklahoma City, Oklahoma, honors the diverse cultural and artistic history of the West, including exhibits on the Southern Plains tribes in the Robert T. Stuart Native American Gallery. We wish Don Reeves, longtime curator at the museum, a happy retirement, even while we encourage visitors to take in the “American Indian Artists: 20th Century Masters” and “Cowboy Crossings,” both of which open this fall and remain on display into 2019. 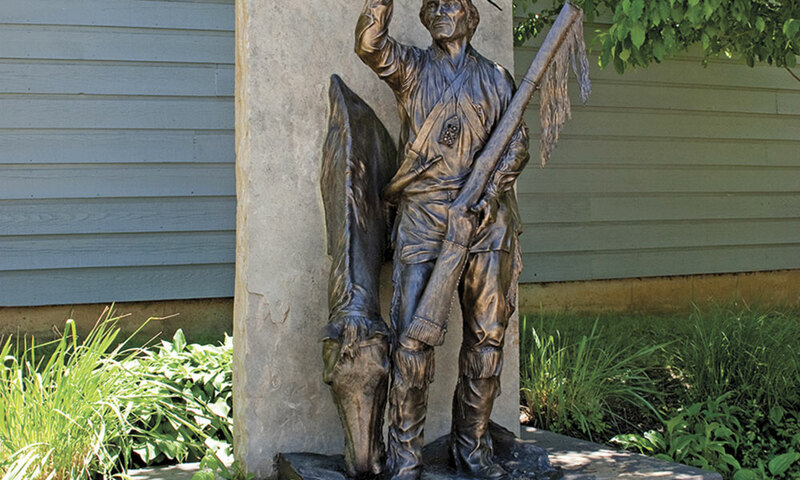 Tom Beard’s bronze, Jim Bridger, depicting the legendary trailblazer with deep Missouri roots in both the St. Louis and the Kansas City areas, greets visitors at the National Frontier Trails Museum in Independence, Missouri. The museum celebrates historic trails this year and presents an introduction to the Oregon-California routes. The displays feature artifacts from the trail and the collections of the Merrill Mattes Library, which includes original trail diaries and other rare books. It sits next door to the headquarters office of the Oregon-California Trails Association. If you support the preservation of Western overland trails, walk over there and ask Kathy for a membership application. 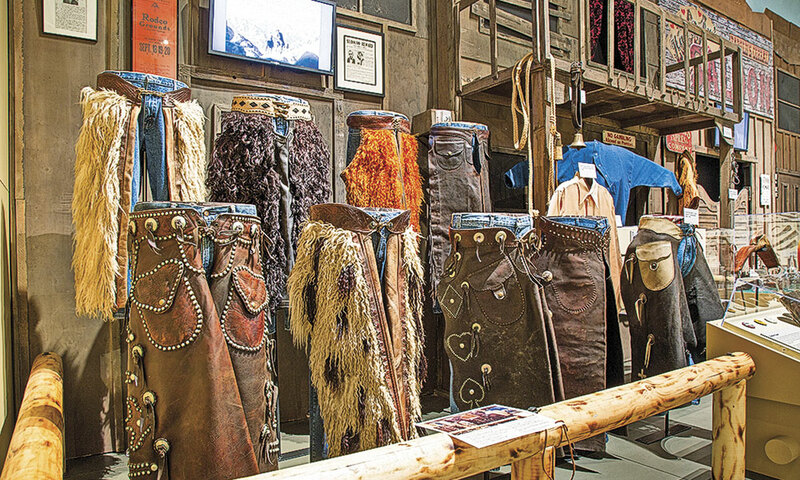 The Cheyenne Frontier Days Old West Museum in Cheyenne, Wyoming, honors the frontier history and people of Wyoming, and presents Cheyenne Frontier Days, a ten-day Western celebration and rodeo held every July since 1897. The most recognized horse in Wyoming is Steamboat, known as a champion bucking horse in the early 1900s, but more identified as the horse image on the state’s license plates. This museum has a permanent exhibit celebrating the horse. For a taste of modern rodeo, see “The Lensmen Project: Cowboy Up!” featuring the photography of country music star Ronnie Dunn and Sports Illustrated photographer Ron Modra. The exhibit continues until February. The Duke never gets old, but each year this museum has a great birthday celebration. 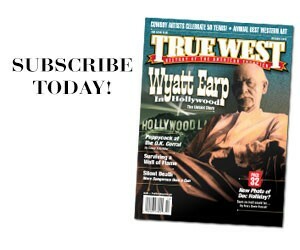 Featured this May was Red Steagall. 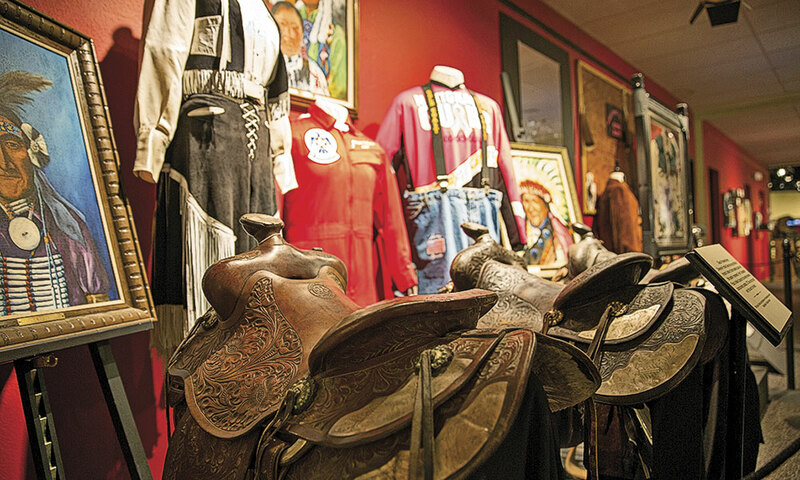 See memorabilia from John Wayne’s film career in the museum galleries. South Dakota recognized one of its most well-known authors this year with the exhibit “A Life’s Work: Paul Goble Illustrations of American Indian Stories.” This children’s book author delighted children (and adults) with his stories of native peoples. The museum displays other exhibits about the Lakota, Nakota and Dakota people, including an Indian camp, a bull boat and other artifacts. Maps dating from 1671 to 1820 are on display this year showing Texas before it was Texas. The cartographic documents are from the Yana and Marty Davis Map Collection. 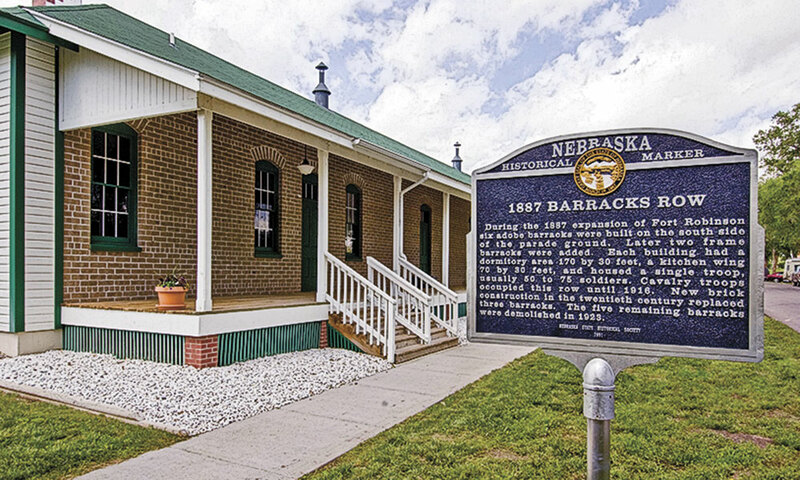 Who doesn’t want to visit the museum that recognizes the history of both Dodge City and Gunsmoke? See dresses worn by Miss Kitty and view clips from the TV show. Watch this museum, as it is planning an expansion project. Begin a journey along the Nez Perce National Historic Trail at the visitors’ center and then head across Idaho to visit the White Bird Battlefield, Weippe Prairie and Heart of the Monster, then head on across Montana to the Big Hole Battlefield and site of the final showdown between Chief Joseph, the Nez Perce and the frontier Army at the Bear Paw Battlefield. Food, art, music, dance and exhibits that depict Pueblo life give a fully rounded experience and insight into the 19 Pueblo tribes in New Mexico. This summer’s featured exhibit, “Long Ago,” reflects the importance of storytelling. Unique and rare fur trade artifacts are on display as is a replica dugout trading post. Learn about the beaver trade, and see Jim Bridger’s gun. This palisaded replica fort includes a well-stocked trading post. You won’t find founder Antoine Roubidoux here, but this replica fur trade post has the dirt floors, types of hides and atmosphere from the 1820s era fort. Partially reconstructed, this trading post near the confluence of the Missouri and Yellowstone rivers was the most important post for upper Missouri fur traders. Gold-seekers headed to Colorado, freighters on the Santa Fe Trail and the frontier Army passed through this fort, which is remarkably well preserved today. The differing perspectives of American Indians and commercial buffalo hunters are highlighted in the visitors’ center, but visit the re-enactment camp in early October. This first Western exploratory trail has sites ranging from the rugged beauty of Cape Disappointment and Fort Clatsop, both near the mouth of the Columbia at the Pacific, to the Columbia River Gorge. 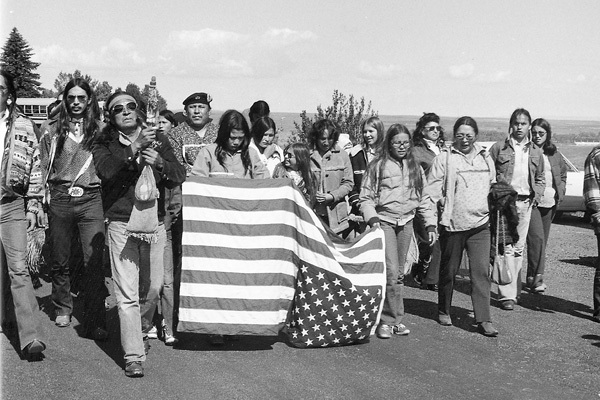 Hundreds of American Indians from several tribes gathered in April to commemorate the 150th anniversary of the 1868 Treaty, believed to be the largest gathering of tribal members at the site in more than a century. Living history programs allow visitors to travel with a wagon train along the Santa Fe Trail, or learn about the buffalo hunters and others who lived and worked here in the 19th century. Everybody in deep snow country needs a two-story outhouse, but here you’ll also find a stagecoach station, tie hack cabin and one of the oldest homestead houses in the area. Walk the dusty street and imagine yourself back in an era when Abel “Shanghai” Pierce was buying cattle that came up the trail. A bit rough-and-tumble, this “town” is as authentic as it gets. The cabins and other buildings were gathered from across the Big Horn Basin. You’ll find diverse structures, including a cabin used as a replica fur trade post and buildings serving the trades including pioneer farming and carpentry. The historic structures at this exceptional institution range from a barn that once sat at the 6666 Ranch east of Lubbock to a variety of homes and even a set of ranch stockyards. Houses, barns and a chapel are among the historic structures from throughout the region now part of this museum. This “city” is a historic area that truly was a town during the gold rush boom of the 1860s, but today’s version also includes buildings relocated from other areas of Montana. Established in 1868 when gold mining started in the South Pass Mining District, this well preserved high-altitude town’s cabins include the one in which Esther Hobart Morris lived when she helped launch a movement for woman suffrage in Wyoming. Opened in June 1928 with restoration of the old log building that had served as the first Territorial Capitol in Arizona and as a home to early governors in the state, the museum celebrates its 90-year legacy this year. Learn about childhood on the trail in the 1860s and 1870s. Touch real history here including the wagon Ben Kern took over thousands of miles of overland trails. Learn about the freighters who forged a route to Santa Fe across Kansas. Fort Caspar Museum Casper, WY. Explore the replica fort and see trail artifacts in the interpretive center. Built by Hudson’s Bay Company, this fort served the fur trade and early trail travelers. After visiting the museum with its stories of the trail and pioneer settlers, you can walk the Oregon Trail to Scotts Bluff National Monument. Imagine a portage around the Great Falls of the Missouri River in this center that highlights Lewis and Clark’s travels in Montana. This replica fort tells the story of the fur trade and Oregon Trail. 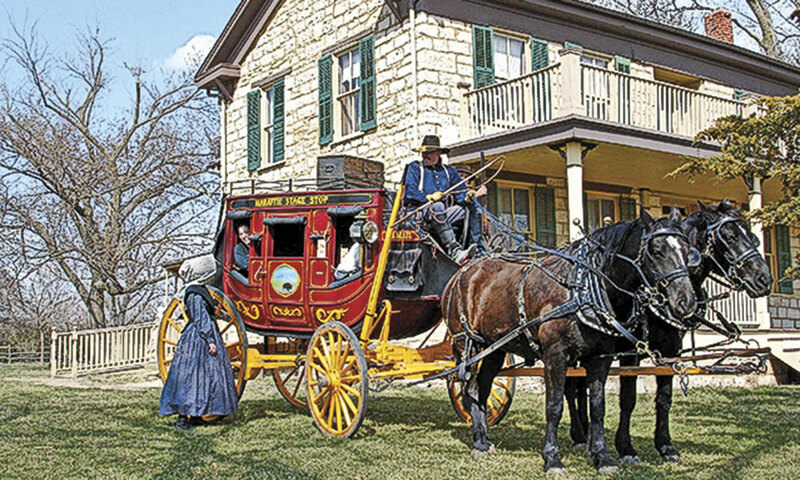 Stuhr Museum of the Prairie Pioneer/Grand Island, NE: Tour the vibrant living history center dedicated to the pioneers who homesteaded Nebraska. 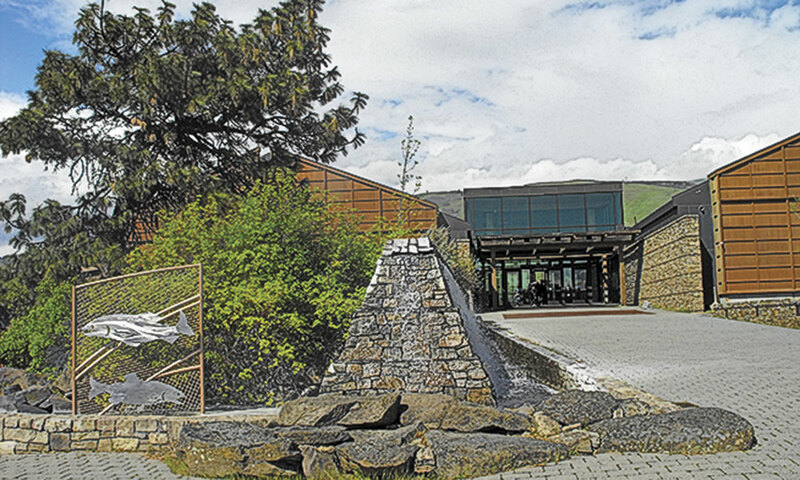 Columbia Gorge Discovery Center/The Dalles, OR: Visitors to the museum will be immersed in the natural and cultural history of the Columbia Gorge region. Select from rooms in the former officers’ quarters that date from 1874 to 1909, or choose one of the 1909 enlisted men’s quarters or cabins. Stay in the 19th-century era City Hotel or Fallon Hotel or choose one of the three locations in the Cottage Colony. Founded in 1859, National Historic Landmark Virginia City’s historic district boasts some of the oldest inns in the region, including the Gold Hill Hotel, the Silver Queen Hotel and the Tahoe House Hotel. The Wortley Hotel, once co-owned by Pat Garrett, was at the heart of the Lincoln County War and is now a bed and breakfast. 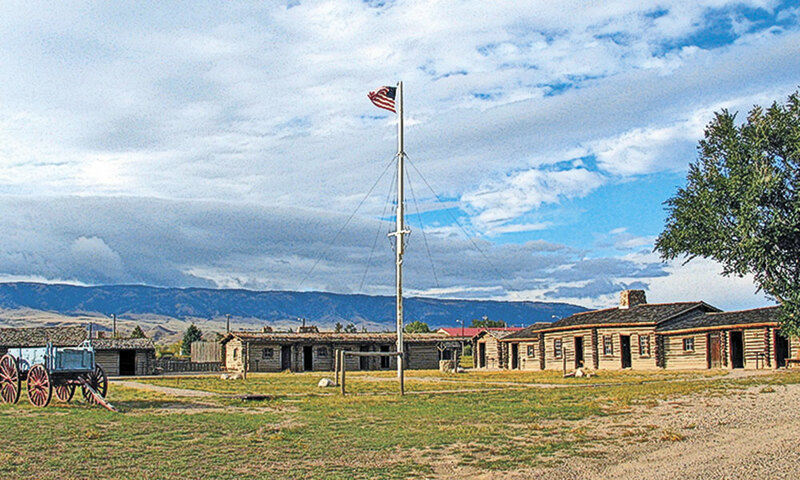 A tour of the National Historic Landmark would not be complete without an overnight in the Ghost City Inn, Connor Hotel or the Jerome Grand Hotel, located in the former United Verde Hospital. The Delta King permanently docked on the Sacramento River, has 44 cabins and the richly appointed Captain’s Quarters. Rough Rider’s Hotel gets its name from President Theodore Roosevelt, who had a ranch nearby. Stay in one of two cottages on the plantation, both dating to the early 20th century. The Quarters at Presidio La Bahia were formerly officers’ quarters. 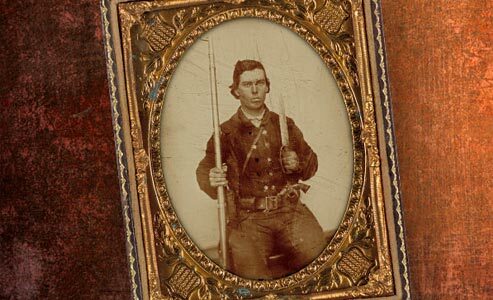 On the Trail of Warring Parties A historical tour of the Kansas-Missouri Border and Civil Wars. 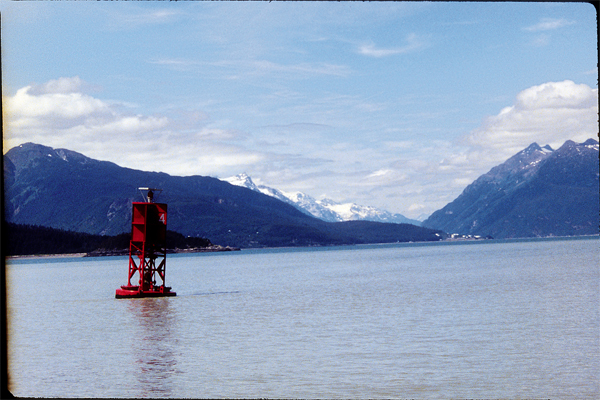 The Klondike Gold Rush Trail From Seattle, Washington, to Skagway, Alaska, to Dawson City, Yukon Territory.